Director – Nicolas Roeg, Screenplay – Allan Scott, Based on the Novel by Roald Dahl, Producer – Mark Shivas, Photography – Harvey Harrison, Music – Stanley Myers, Creatures – The Henson Creature Workshop, Production Design – Andrew Saunders. Production Company – Jim Henson Productions/Lorimar. Young Luke is warned by his grandmother about witches who hate all children. Witches can be recognised because they have no toes or hair. Luke and his grandmother go on holiday to a seaside resort hotel. There Luke inadvertently eavesdrops on a meeting of the Royal Society for Prevention of Cruelty to Children, only to find that the members are witches. He learns of the witches’ plans to open a series of shops selling sweets, which contain a formula that will turn children into mice. Luke is then discovered whereupon the witches hold him down and force-feed him samples of the formula, turning him into a mouse. As a mouse, Luke must try to avoid the head witch Miss Ernst’s attempts to kill him, get back to full size and warn people of the witches’ plan. Any production that brings the diverse talents of Nicolas Roeg, the arthouse director of films like Performance (1970), Don’t Look Now (1973), The Man Who Fell to Earth (1976) and Insignificance (1985); macabre and children’s story writer Roald Dahl, best known for Willy Wonka and the Chocolate Factory (1971); and Muppet creator Jim Henson together has to be something to see. Indeed, a production with any of these names on its own would make it worth watching, let alone one that unites all three creative names under one roof. Roald Dahl’s children’s stories come with a gleefully malicious undertow, one where the deserving receive grotesque punishments and the unassuming and good-natured are rewarded. Nicolas Roeg is a director often overtaken by his pretensions towards artistic affect. He is certainly a peculiar name to find attached to a Roald Dahl adaptation. Nevertheless, Roeg keeps his tendency to pretensions in check and does a particularly good job of preserving Roald Dahl’s macabre essence. 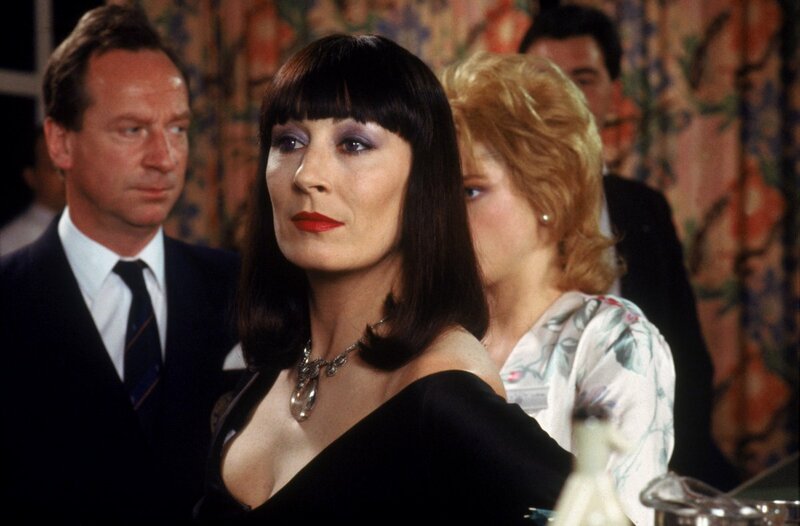 The Witches is a film that genuinely takes one aback with its gleeful malice, especially so when placed in comparison to the blandly G-rated inoffensiveness of other children’s films. Nicolas Roeg serves up some marvellously horrid images of decapitated fingers and witches malevolently pushing baby carriages from cliffs. 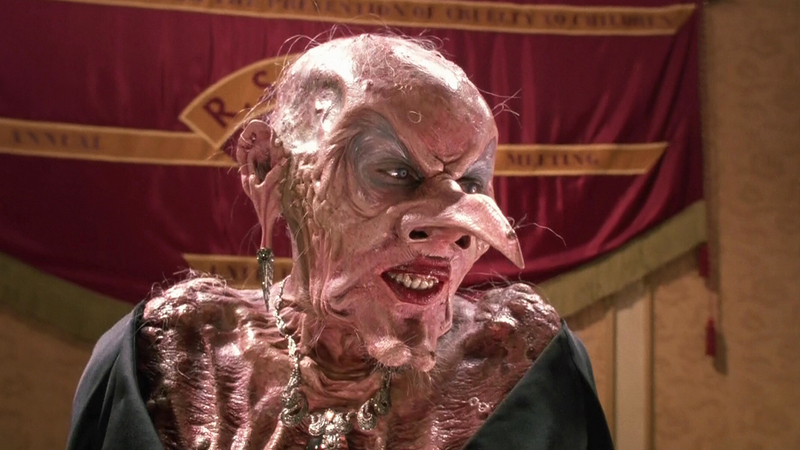 There is a tour-de-force of makeup grotesquerie in the scene where the witches remove their wigs to reveal scabrous scalps beneath and Anjelica Huston shows her true form as a horny, warted witch with a giant proboscis, and where they gleefully hold Jasen Fisher down to turn him into a mouse. There is also a beautifully self-contained vignette at the start of the film where Mai Zetterling tells the haunting story of a childhood friend who was left trapped in a painting by a witch where the image would move to a different position every day. Equally, Nicolas Roeg also preserves the other side of Roald Dahl, the one that offers a poignant sweetness in contrast to the macabre. The Witches reaches a lovely ending with Charlie Potter’s mouse boy insisting he is perfectly happy as he is: “I’ll live in the kitchen cupboard. No more school, no more homework … Don’t worry, Mum, you’ll get used to it” and the wonderful final images with him riding around his house in a toy train and flying in a model plane. The overall result is sublime. The Witches (2020) is a planned remake from Robert Zemeckis. Other Roald Dahl screen works include:- the short-lived anthology tv series Way Out (1961), which Dahl wrote for and hosted; the screenplays for the James Bond film You Only Live Twice (1967) and Chitty Chitty Bang Bang (1968); the children’s classic Willy Wonka and the Chocolate Factory (1971); the psycho-thriller The Night Digger (1971); and the tv series Tales of the Unexpected (1979-81), an anthology series adapting Dahl’s macabre tales. The BFG (1989), James and the Giant Peach (1996), Matilda (1996), Charlie and the Chocolate Factory (2005), Fantastic Mr. Fox (2009) and The BFG (2016) are posthumous adaptations of Roald Dahl’s children’s works. Nicolas Roeg’s other genre films are:– Don’t Look Now (1973), a film about precognition; The Man Who Fell to Earth (1976) about an alien visitor; the surrealist Dennis Potter collaboration Track 29 (1988); the supernatural thriller Cold Heaven (1991); and Puffball (2007) about witchcraft and pregnancy.